Sometimes standard central heating systems are not the best option for a home. In such situations a number of alternatives can be used, such as space heaters. One of their types is electric baseboard heater. They can be used as a primary or a secondary source of heating. This heating alternative is a low-cost and energy efficient option of heating a home. Generally they are compact and require easy installation. 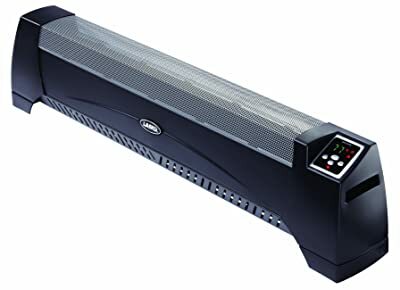 We have picked the best electric baseboard heaters available on the market and to help you compare and find the perfect for yourself we have compiled the electric baseboard heaters reviews. 3 How Do Baseboard Heaters Work? 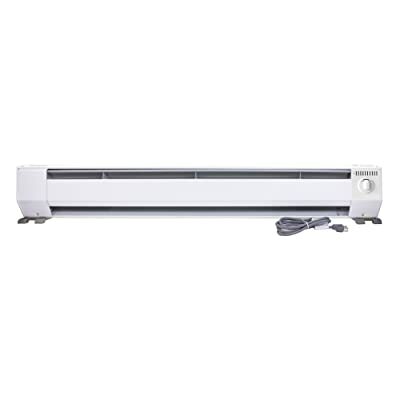 One of the best rated and also affordable best baseboard heaters is the Cadet 2F500-1W. It comes in a rugged durable design made with steel construction. It operates with 500 watts and includes only one heat setting. It’s a basic baseboard heater that offers quiet operation while heating a room while circulating the air on the principle of convection. It does not feature a thermostat (can be purchased separately), but has thermal safety cutoff. Lasko 5624 is a silent and low-profile heater. It’s lightweight and has handles on each side, making it easy to manage and mobile. The Lasko heater runs on natural convection, silently circulating the warm air. The heating element inside the unit is ceramic. It operates with 1500 watts, providing comforting warmth for rooms of around 100-300 sq. ft.
For temperature control it has a digital display and features a thermostat with timer. The heating settings include only one standard option. Lasko 5624 is ETL listed and ensures safety with its tip-over and automatic overheat features. Fahrenheat is also a good supplementary energy efficient heating option. Its power with heating capacity of 5120 BTUs is ideal for small rooms with the size of about 150 sq. ft. It features low energy consumption with 2 settings of low 1000-watt and high 1500-watt operation. You can also change the temperature using the built-in thermostat. It quickly warms the room, evenly distributing the air and leaving no cold spots. The FBE15002 ensures safe operation with high temperature and tip-over cutoff features. The solid design is made for durability with high-impact Lexan end panels. 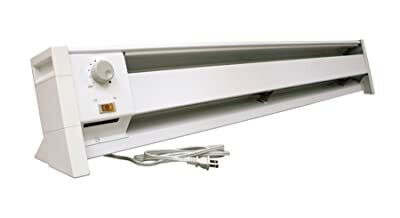 Fahrenheat PLF1504 is a UL listed baseboard heater that runs on natural convection. Its installation requires direct mount on any floor tile or carpet. It offers quite heating operation. The heat of the Fahrenheat PLF1504 is produced by a unique heating element that is completely immersed in a permanently sealed specially formulated heat transfer liquid. However, it does not have multiple settings and requires a thermostat that needs to be purchased separately. The benefit of the King KP1210 is its portability as it requires no permanent installation and doesn’t have any complicated wiring. The 1000 watts output provides powerful heating and even distribution of the air across the room. It’s designed to ensure longevity with a heavy duty aluminum design and an aluminum heating element. It offers convection heating and adjusting temperature with the built-in thermostat. It efficiently heats the room with no noise to disturb you. So it can be used even in the nursery or bedroom. It’s also designed with safety in mind, so it automatically shuts off in the case of overheating or the unit getting knocked over. Marley HBB750 uses a strong convection flow that delivers and evenly distributes the warm air across the room. The element has heat retention qualities, so when you turn the baseboard heater off, the unit will still continue to radiate heat. It operates with 750 watts, quickly heating the space. It requires a wall thermostat, not included with the heater. There are various types and sizes of baseboard heaters, so look for an option that would best fit your home. Some of the units require a wall thermostat that has to be purchased separately, while others equip a built-in dial thermostat. Before purchasing check the following features of the unit. 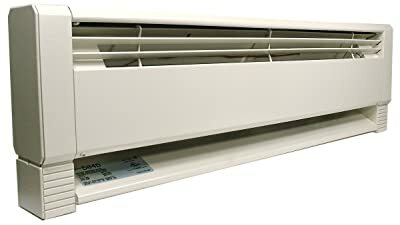 Types of baseboard heaters. You have the choice of either standard electric or hydronic electric heater. Standard is most popular choice among users. They use convection and quietly heat and circulate the air. Hydronic give a softer heating. These units are the suitable option for people with allergies. Wattage. The models also vary by wattage and voltage. However, most use 500 to 1500 watts and have 120 to 240 volts. Size. Find a place where you would like to install the baseboard heater and find the unit that will fit. Optionally, you can get a portable baseboard heater, so you won’t have to install it and will be able to heat different areas. One of the convenient ways to heat your home is with the help of an electric baseboard heater. Their compact and low-profile design allows them to stay inconspicuous while in operation. Usually they are wall mounted. However, there’re some free standing options as well. The heating element is typical encased in metal sheaths. They are surrounded by aluminum fins that produce the transfer of heat. Utilizing the process of convection which employs drawing the cool air from the room into the bottom of the heater. The air gets warmed within the heater and then gets out the top vents of the unit and rises back into the room. The heating element on some of the baseboard heaters also radiates the heat. Electric baseboard heaters are considered to be on of the more efficient options of space heating. The power for most baseboard heaters is in the range from 500 to 2000 watts. So these units are suitable for heating areas of about 50-200 square feet. They make a great choice for supplemental heating of bedrooms, offices, or the whole house on the room-by-room basis. Most of the baseboard heaters feature a thermostat that makes the unit cycle on and off in order to maintain the desired temperature in the room, thus conserving energy. Don’t block the airflow. The installation of baseboard heaters requires their placement 1/2 inch above the floor or carpet. This allows proper air flow through the system. Also, try to keep the items at least a foot from the front and sides of the heater. Thermal cutoff. Most of the heaters are designed with this feature that protects the unit from overheating. Fire protection. Don’t place inflammable objects close to the baseboard heater. If you have the heater installed under the window and there’re window drapes hanging above it, make sure that they are far enough not to touch the heater. Safe thermostat control. If you’re using more than one baseboard heater in a single room, its best to use only one thermostat for control of both units. Don’t get tempted to heat up the room faster by setting the thermostat to a very high setting. Be patient and let the heater warm up the room gradually. Child and pet proof. If you’ve got kids or pets in the house, its best to get extra protection by also installing a cover for the baseboard heater. On most of the modern units the cover is already included. Cost effective. Baseboard heaters are much more simple and cheaper to install than central heating systems. There’re no expenses such as purchasing duct work or furnace. Low energy bills. You can set a desired temperature and the baseboard heater will operate by cycling on and off to keep the temperature in the room at that level. Also, heating just a single room and not the whole house you conserve more energy. Quiet operation. Most of the systems don’t emit much noise during operation. As it uses the convection process to produce warm air, a process does not require a fan, it eliminates any noise. Safe to use. These units are extremely safe to use. Additionally, these heaters come with such safety feature as thermal cutoff. So if the baseboard heater starts to overheat, the system automatically shuts off and turns back on after it returns to normal temperature. Low maintenance. As these heaters don’t have any moving parts inside them, making it a really low maintenance appliance. You will only need to remove the excess dust from the heaters frill from time to time. Baseboard heaters offer great supplemental heating. They are a lower cost option if you need to heat a certain area, such as a living room or bedroom. Best electric baseboard heaters offer efficiency and are equipped with essential safety features. The top picks mentioned above have the highest rating on Amazon and they have been highly praised for their efficiency by the majority of users in their electric baseboard heaters reviews.